Having presented my writing group with the first complete draft of my novel in progress, I duly took a writing summer break. Most of my many plans to get things done were ditched in favour of spending time with my terminally ill brother, who I’m glad to say is reasonably stable for the time being. And I did get a holiday with my husband and a weekend away with some old mates. But still I was determined to sort out the mess that was my bedroom/workroom. You know, when you can’t draw the curtains or reach for a book without knocking over dusty piles of papers and other assorted unsorted things? I feel weighed down by stuff: my minimalist aspirations smothered by maximalist practice. Having elderly parents makes me more aware of the colossal amount a person can collect in a lifetime, much of which can be overwhelming to the people left to sort it out. My plan to get ruthless included the momentous decision to destroy all my journals: a pile of about 15 hard bound books of personal and emotional writing (as distinct from the spiral bound writer’s notebooks for jotting down ideas and rough drafting). The journals fulfilled a need to splurge my inner thoughts and feelings onto a page, and in doing so to make sense of them. I started my first diary at 12, inspired by Anne Frank, and filled two volumes with lonely teenage misery, stopping as soon as I made some friends. But journal writing continued to be a tool I relied on heavily throughout my 20s and 30s and into my 40s, especially when the going got rough. Somehow the act of writing externalises a problem and in doing so has helped me gain a sense of control. I have certainly benefited from the well documented therapeutic effects of journal writing. But in the past few years I have felt less inclined to internal navel gazing and have tried to focus more on looking out at the world. I was inspired by a friend who composted all her old journals, making me wonder why on earth I want to carry these volumes of baggage to the end of my days. Do I really want whoever survives me to have to even think about wading through this potentially upsetting emotional bilge? I was ready to purge the splurge. I couldn’t resist a last glance at the journals, even though I worried that reading them could catapult me back to difficult headspaces – the last thing I need. But this didn’t happen for the most part. Some of what I read made me sad, quite a bit made me cringe, a lot I skipped out of sheer boredom, but mostly it gave me a sense of how many things that seem insurmountable, or feel like they will never change, can fade and pass and simply seem a long time ago. One advantage of growing older. Sometimes it almost feels as though I have been documenting my life for posterity. From my self-conscious early teenage diary where I explained the rules of Monopoly as if to an audience in the distant future, there is a sense of writing for someone else’s eyes that I found hard to shake off even much later. Anaïs Nin, Virginia Woolf, eat your hearts out! How many journal writers secretly imagine future readers? Not that there is anything wrong with published diaries: Anne Frank, Anaïs Nin, George Orwell, Tony Benn are diverse examples of diarists I have enjoyed immensely. But reader, my journals are not of this calibre, and I doubt I will be the subject of a bestselling biography. These days the blog provides all the platform I could need for anything I want to share publicly. 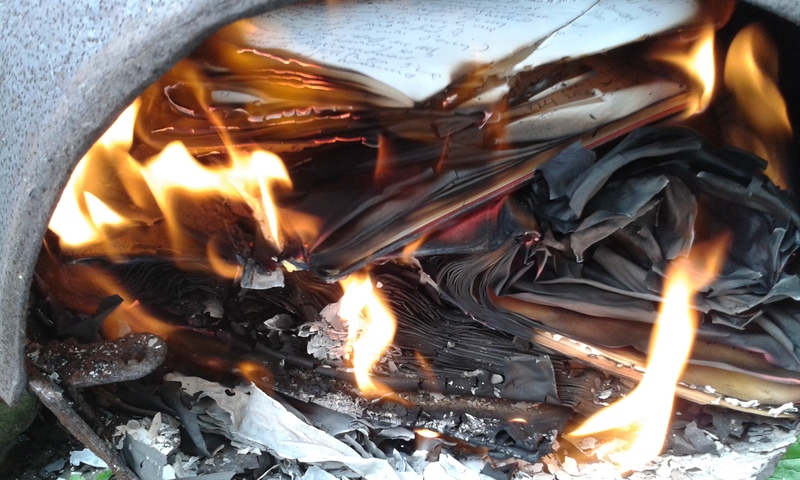 And so to the brazier they went, taking most of a sunny afternoon to burn. 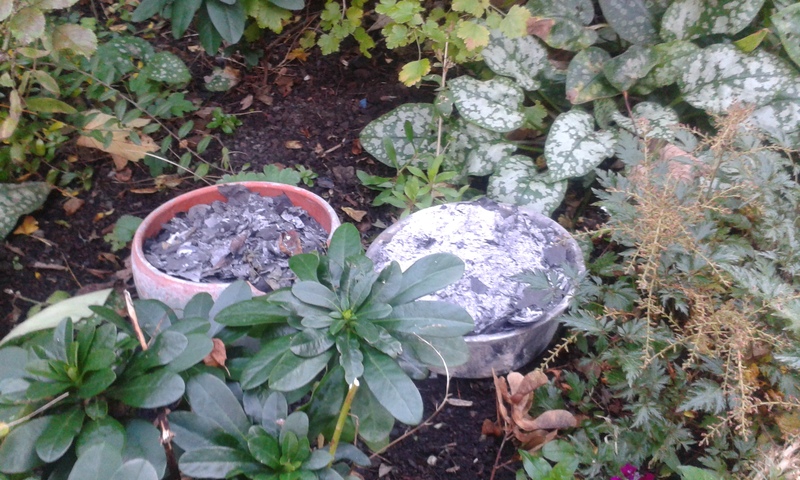 All that remains is a couple of pots of ashes ready to dig around the gooseberry bush. But enough of displacement activity! I have received the feedback on my draft from my writing group, and am ready to launch into editing my novel with my workspace and headspace wonderfully liberated of a great mass of clutter. This entry was posted in Contemporary fiction, Creativity, Diary writing, Journal writing, Women Writers, Writers, Writing, Writing process.